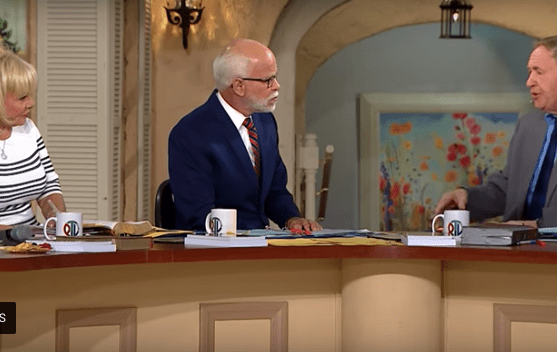 Bakker wife #2, Jim Bakker and John Shorey wonder (seriously) if Billy Graham is one of the 24 elders around God’s throne. He continued, “Billy Graham, it’s safe to say, led more people to Christ than any man in history.” Paul might raise an eyebrow. Bakker’s newest wife can be seen nodding her head and agreeing in the background. You can watch the video below. Thomas, by the way, is believed to have taken the Gospel to India. Eusebius records that Thomas at least made it as far as the Parthians. There is a general historical agreement that he died via martyrdom in India after the local authorities ran him through with the spear. Jesus – knowing what he was doing in selecting his disciples – kept Thomas faithful to him, and he died a martyr after heading up the Apostolic work on a brand new continent. Matthias – who was chosen by God’s will through the casting of lots, just prior the coming of the Holy Spirit – took the Gospel to Cappodocia and died a martyr in modern-day Georgia, when he was stoned to death and beheaded. Billy Graham’s corpse, on the other hand, was laid in the U.S. Capitol, and he was venerated by atheists, Romanists, Protestants, and outright pagans around the world. He was not martyred for Jesus, nor did he take the Gospel to any yet-reached place. He did, however, preach a Gospel of inclusivism, ecumenism and pseudo-Universalism.